Where USERNAME is obviously your username. 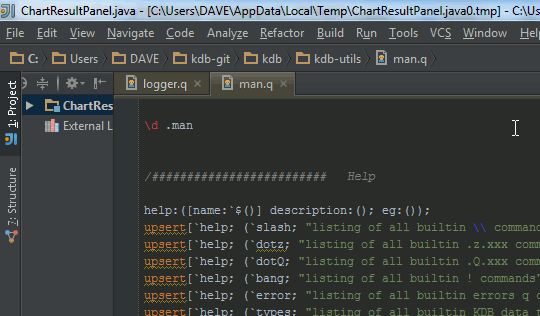 Then restart intellij and open a .q file. We’ve updated our notepad++ qlang.xml to provide code folding and highlighting of the .Q/.z namespaces. We’ve now posted all source code from this website on our github kdb page. Additionally we are open sourcing qunit, our kdb testing framework. We look forward to receiving pull requests to fix our (hopefully few) bugs. You are currently browsing the TimeStored weblog archives for the month May, 2015.